Heritage Minister Mélanie Joly said she will decide "promptly" about the scale and location of the controversial memorial to victims of communism, which she called a "priority" in her portfolio. Heritage Minister Mélanie Joly said she will decide "promptly" about the scale and location of the controversial victims of communism memorial, which she called a "priority" in her portfolio. Joly made the statement at the National Art Gallery Thursday afternoon, following a meeting with Ottawa Mayor Jim Watson, who has been a vocal opponent of the memorial's size and planned location on Wellington Street west of Parliament Hill. 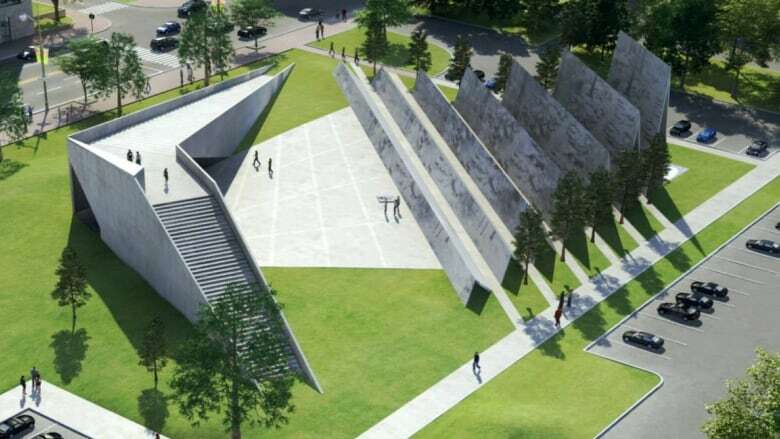 Architecture and heritage groups have also criticized the plan to build the memorial on a vacant lot between the Supreme Court of Canada and Library and Archives Canada. ​Joly, the minister responsible for the National Capital Commission, said she still needs to meet with other stakeholders to make sure she has all the information she needs to make a decision. Ludwik Klimkowski, chair of Tribute to Liberty, the group behind the memorial, told CBC News he is meeting with a representative from Joly's office tomorrow and that he hopes to meet with the minister next week. Watson said that Joly is "wise to consult" given that there was "not proper consultation" under the Conservative government. He said a two to three months would be an appropriate timeline for a decision. Watson has echoed the Royal Architectural Institute of Canada in suggesting that the monument be built in the Garden of the Provinces and Territories, a little further west down Wellington Street from the Conservatives' preferred site.